For years, football at the University of Kansas was nothing more than a time-filler while students and alumni awaited the start of basketball season. That changed dramatically in one magical season in the fall of 2007 when an undersized quarterback led the Jayhawks through 11 straight wins and made Memorial Stadium the “in” place on a Saturday afternoon in Lawrence. Todd Reesing’s football career at Kansas is a fairy-tale story that began improbably and ended the same way. But he and his teammates took Jayhawks fans on a ride they had never experienced before – the heady heights of playing for the No. 1 ranking in college football and their first-ever win in a major bowl game when they defeated Virginia Tech 27-24 in the Orange Bowl following the 2007 season. A year later, Reesing was even more prolific, and the Jayhawks played in consecutive bowl games for the first time in school history. That season was punctuated by Reesing’s scrambling touchdown strike to Kerry Meier that beat the the Missouri Tigers and lifted the Jayhawks into the Insight.com Bowl where they thumped Minnesota. His senior season was a disappointment, marred by confrontation between members of the football and basketball teams, a university investigation into the conduct of the head football coach, and a seven-game losing streak to end the season. 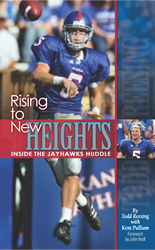 In Rising to New Heights: Inside the Jayhawks Huddle Reesing talks about it all, the highs and lows of making Kansas football relevant again and his journey through college football with all the skills of a big-time quarterback but none of the size. Todd Reesing, Todd passed for more yards and touchdowns than any quarterback in KU history. More importantly, he was the quarterback on the first Jayhawks team ever to be ranked as high as No. 2 in the Associated Press college football poll. He quarterbacked Kansas to back-to-back bowl games for the first time in school history, leading the Jayhawks to wins in the Orange Bowl against Virginia Tech following the 2007 season and in the Insight.com Bowl against Minnesota following the 2008 season. He graduated from KU in December 2009 with a double major in economics and finance. Todd grew up in Austin, Texas, where he was the Texas 4A Player of the Year as a junior at Lake Travis High School. Kent Pulliam, Kent spent more than 30 years as a sports journalist for The Kansas City Star. He has won several writing awards from the Associated Press Sports Editors and the Missouri Press Association. He lives in Westwood Hills, Kansas, with his wife Gina. This is his second book.